Peter's collection is remarkable and in this two-part series he shares his expertise in suzanis. In his first article, Peter provided an overview of Uzbek suzanis. This piece focuses on suzani design. The identity of modern-day Uzbeks was formed in the crucible of the Silk Road, which absorbed and merged different ethnicities and cultures into one harmonious whole. The Uzbeks emerged from a historical process and – unlike the Turkmen or the Kyrgyz - can be regarded as a group bonded by its ethnic origin. 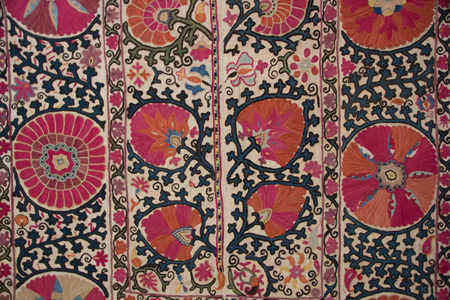 With the link to the Silk Road, suzani designs and techniques benefited from the exchange of ideas between the East and the West, being inspired by a wide rage of influences, from Chinese floral motifs to Islamic geometric abstractions. With few exceptions, suzanis of the 19th century and beyond reflect the style of a well-preserved tradition, their floral design motifs reflecting the colourful gardens of Central Asian houses or - as some people interpreted them - symbols of a Muslim paradise garden. Some design motives still represent nomadic art. This applies in particular to the embroideries of the Lakais, a semi-nomadic group that originally lived along the border region of Uzbekistan and Tajikistan. A prominent motif is the nuska gul (ram’s horns), which is a widespread symbol in many carpets of the Central Asian steppe tribes. Centuries ago, the Lakais had isolated themselves from the main body of the Uzbek tribes and had retained the steppe tradition of the mounted warrior-herdsmen, long after the other nomadic tribes had abandoned their nomadic lifestyle. It is believed that the patterns and symbols of Lakai reflect the designs of Mongolian hordes, from which the Lakais - quite unlike the other Uzbek groups - originate. In the 1920s, after losing their independence, the Lakais migrated from the Uzbek-Tajik border region to Afghanistan, where they settled north of the Hindu Kush. This explains why quite a few old and well-preserved Lakai suzanis still can be found in the Kabul market. A different type of suzani is made in Tashkent. The most famous is the palak type, which may have a variable number of decorated circles. 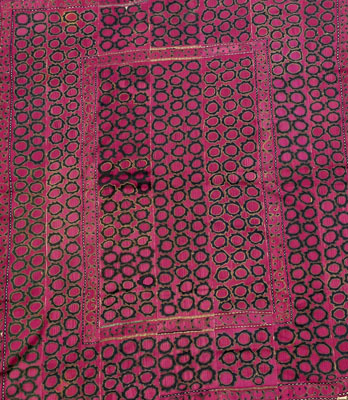 The entire surface of the palak is covered with solid, embroidered symbols and dark red circles. Palak (or falak in Arabic) means the sky, fate or the rotation of the sky. Falak is also a female name meaning sky or star. The warm red color symbolizes sun or fire worship indicative of the design’s pre-Islamic origins. The symbols surrounding the moons are enigmatic. Whether they describe reptiles or any other creature is left to the observer’s imagination. The design of the Khodjand suzani is a fusion of East Turkestan (now Sinjiang in China) and Tashkent influences. When looking at the suzani from afar, one seems to recognize the design of the famous Khotan pomegranate carpet. However, the small circles may well be derived from the moon design of the Tashkent palak suzani. 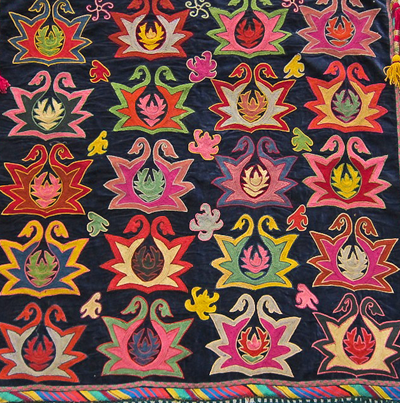 Bukharan embroidery is among the most spectacular of Uzbek suzanis. Typical Bukharan design consists of flowers on thin branches evenly distributed over the surface of cloth, or round rosettes with long stems. Various shades of blue combine with light yellow and green and a bold red as the dominant color. 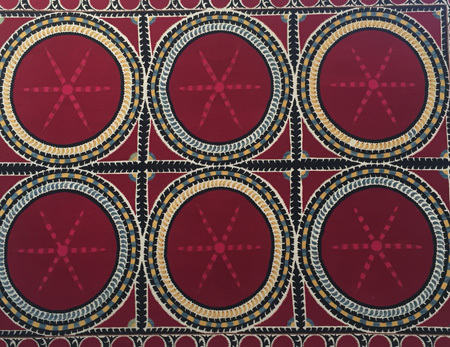 The large, central rectangular field is worked with a bold medallion repeated in each of the four corners of the embroidery. Two narrow border bands - the inner one framing the center medallion and the outer enclosing the entire suzani - show a meandering band, which may be derived from Chinese artwork. It may be noted that the vibrant circular motives are also characteristic of Lakai embroideries. While the beginning of the 20th century marked a deterioration in the quality of the embroideries, the art all but disappeared during the era of the former Soviet Union. During the 1960s, an orchestrated attempt was made by the Soviet regime to revive traditional Central Asian handicrafts, notably carpets and suzanis. The quality of work, however, remained poor. Since the early years of this century, the making of suzani embroideries has come back on a broad scale and with great creativity. Not only have traditional designs been recreated, often inspired by modern ideas, but suzanis have also entered the fashion and art décor scene. It was perhaps inevitable that this process also introduced industrialized methods of making suzanis on a large scale – albeit not yet in Uzbekistan.